Trading news forms the basis of fundamental analysis. This video was prepared by Binary Blue Sky coaches, for an OptionTrade webinar. However, OptionTrade has disappeared from the market – they decided to stop! Just in case, I am going to paraphrase the whole video in case you don’t want to, or can’t, watch the video. All news releases are scheduled at least one month in advance. You can learn about them from the economic calendar of, for example, forexfactory or on the page Binary Options Strategy – Economic Calendar. Therefore, it’s always good to decide and choose, in advance, what events (or news releases) you want to trade and in what style. There’s nothing worse than doing everything at the last moment and then panic. I recommend preparing everything, at least the morning before. It is important to trade news releases that really move the market. Therefore, I’d only chose the ones highlighted in red (or with 4 stars). These are the so-called high impact news. First, wait for the news. E.g. forexfactory always shows an information, whether the positive result will have a negative or positive effect on the currency price. See the Figure a below. We see that at 2:30, the news on unemployment in the US will be released. If the number (Actual) is lower than predicted (Forecast), it means that the country’s economy is doing well, and it could conceivably strengthen the US dollar. This means that the chart of the currency pair EUR / USD will go down, because the dollar against the euro will grow. To the right, we also see that in the past the Actual number has almost always really been lower than the forecast. Then we wait for the confirming one or two candles – which is around 5 to 15 minutes. If the candles move by the predicted direction, we enter the trade. 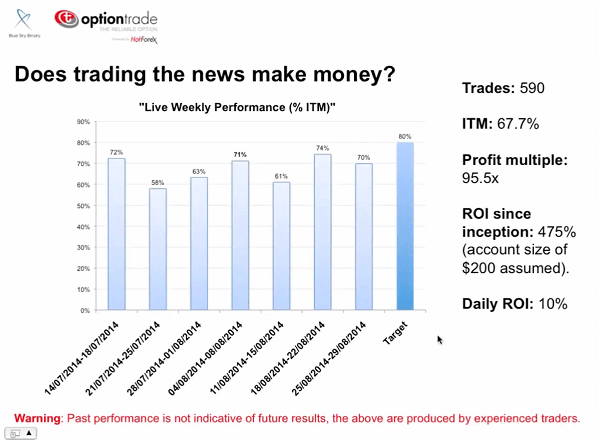 Expiration time 30-60 minutes – it will help us cope with a big volatility that is typical for news releases. It is important that the chart is in an uptrend or downtrend depending on its predicted direction. Step 3: Can you make money trading fundamentals? According to experts, BSB (Blue Sky Binary) Yes! The strategy, described above is used by them and it has brought them great results. I don’t really trade fundamentals much, so I do not have much to say. Have a look at the success chart with trading fundamentals. It is believed that only 5-10% of binary options traders make money on binary options. Therefore, before carelessly entering into a trade, you need a lot of concentration and learning. Be it reading our articles or by practicing in the demo account. The fact that it will shake your entire account is not a bad thing. Yes – you might lose money – but that’s trading. According to the statistics released by the Japanese broker, approximately 25% of accounts that are in a loss one month, swing into profit in the following month.